About a month ago I made some breakfast egg “muffins”. They worked great and I liked the concept a lot. I decided to try something else. I looked around for a breakfast muffin that was low in calories and didn’t have 1 cup of sugar in it. One of my biggest pet peeves about Pinterest is that if you search for “healthy recipes” you most definitely do NOT get healthy. What pinners think is healthy is insane. Sorry but any recipe that calls for multiple cups of sugar is insane. Anyways, I finally found a recipe that was healthy. It called for very little sugar and used the sweetness of the banana and applesauce instead. I used unsweetened apple sauce. I added a little less than 1/4 of a cup of craisins to the mixture and it was a great addition. Adding that changed the calorie count to 85 calories. Still a great number! Preheat oven to around 180 degrees C. Grease your muffin tin with low-fat margarine or cooking oil spray, or line with paper muffin cases. Mix together the flour, baking powder, baking soda and salt in a medium bowl. 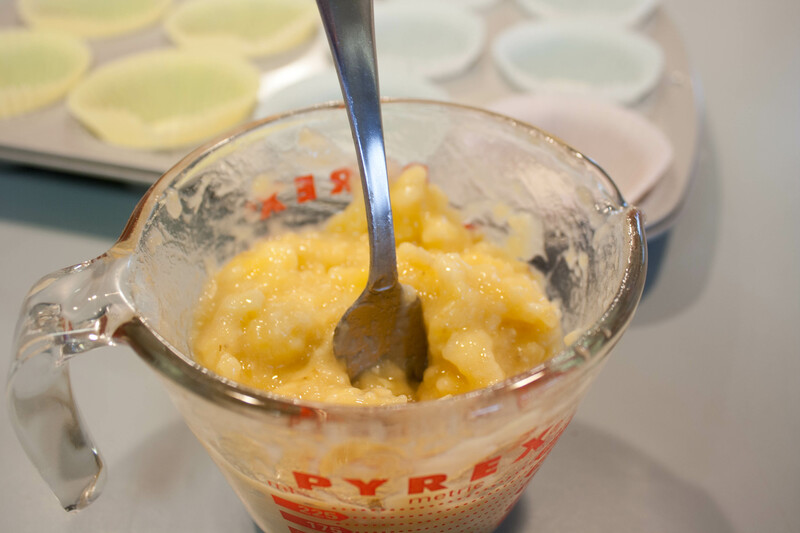 In a separate bowl, mix the sugar, egg, banana and vanilla extract. Blend well and add the applesauce. Slowly combine the two mixtures together and mix well. 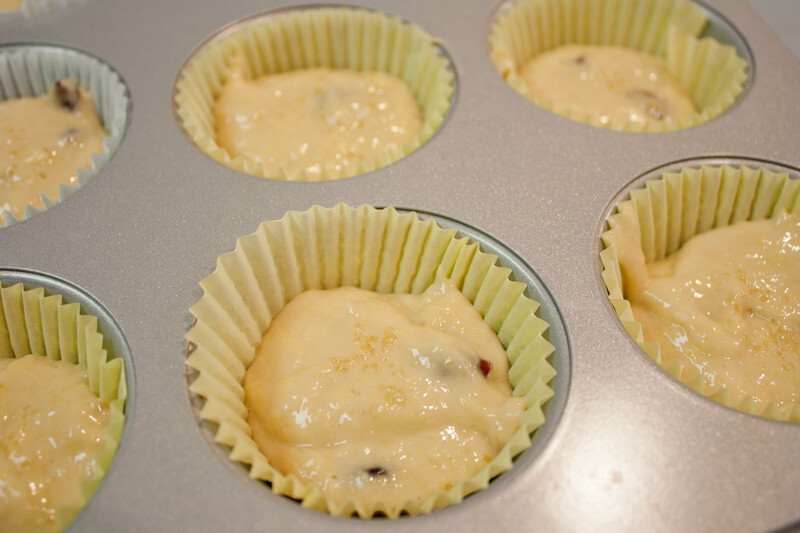 Scoop the batter into the muffin tin. Bake for 15-20 minutes or until golden. The kitchen smelled so homey and wonderful as it was baking. I had to sample the muffins–you know, to make sure they were edible. 🙂 I had one after lunch. It was moist and subtle–not so sweet it tasted like a dessert. It’s probably the perfect muffin to eat as breakfast. No sugar crash from frosting and chocolate chips, etc. For breakfast during the work week I had one muffin and an egg. It was filling enough to get me through the morning to my mid-morning snack (and apple). 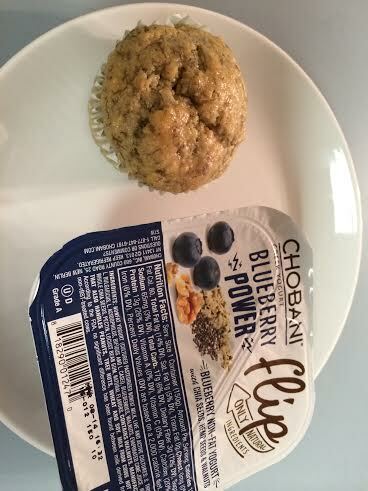 The next morning I tried having one muffin with some Greek yogurt. I needed something quick because I overslept and was running late! That breakfast was 275 calories, and I had some coffee once I got work. The next day I had a muffin and some plain Greek yogurt, another day I had 1/2 a serving of rice krispies cereal with a muffin. Another day I had one egg and a muffin. The combinations with the muffins were great and I felt really satisfied. The banana muffins were delicious too. 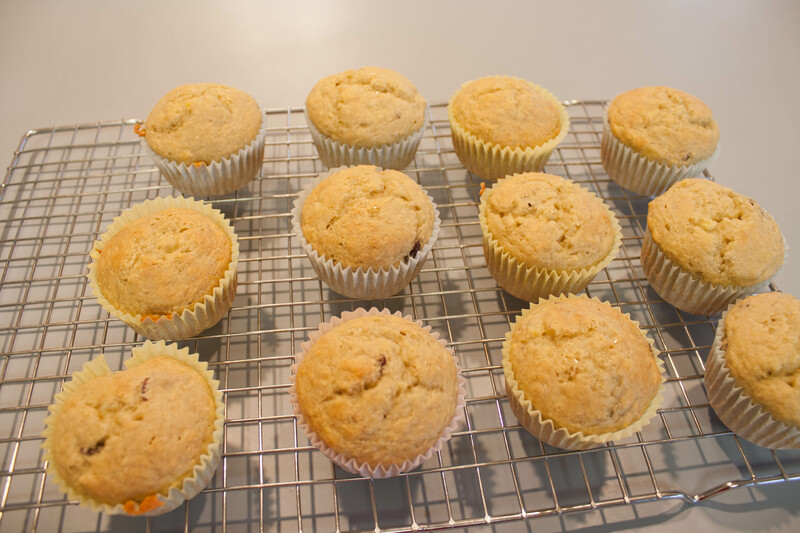 You could easily have these muffins as a mid-day snack or maybe a pre-gym snack, as well. I think next time I make these I’d try adding some nuts or maybe some blueberries to it as well. I REALLY liked the addition of the Craisins. This recipe will definitely stay in rotation! These look great! I might try them with coconut flour. I just started the Fast Metabolism Diet, and I’m really enjoying it (Day 3). I’ll be writing about it on Tumblr, and will send you the link soon. For breakfast Monday and Tuesday, I had a shake with strawberries and oatmeal, and it kept me very full until lunchtime. That’s always the test of a good breakfast. I have to look good for someone’s wedding, right? Yes, send me the link!! I want to experiment with these muffins sometime. Try making them gluten free, try other ingredients in it like nuts maybe. So quick question – I never get notifications if you comment on my comment. Which of the “Notify me of follow-up comments by email” do I need to click. There are two. I have the comment luv box checked but that doesn’t seem to help me. These look really good! I love breakfast muffins, but they are always so bad for you. I will have to give these a try. Mary Ellen Quigley recently posted..The Hair Loss is Driving Me Nuts! They were delicious and I was super happy they turned out because they are so low in calories. OMG, I am so with you on “healthy” recipes on Pinterest. One recipe I was looking for – it was a stew, called for browning the beef in 1/2 cup of “light” olive oil. Crazy! Biz recently posted..My Bizzy Birthday . . .Guest Post From Tony! The thing on blogs that pisses me off is the sugar-free and it is either splenda or worse – using honey or molasses and calling it sugar-free because it is not white sugar. So stupid. Sugar is sugar. Anyway, I love using a banana as the only sweetener in things. That’s why I mash up a banana into to cooking water of my oats. It cooks in and makes it sweet and I get a fruit serving in. Whisk in egg whites for protein and I am good to go! And why would you want sugar free? It usually means it’s got some weird chemicals in it. I’d rather use real sugar OR use fruit to sweeten it! Yum! 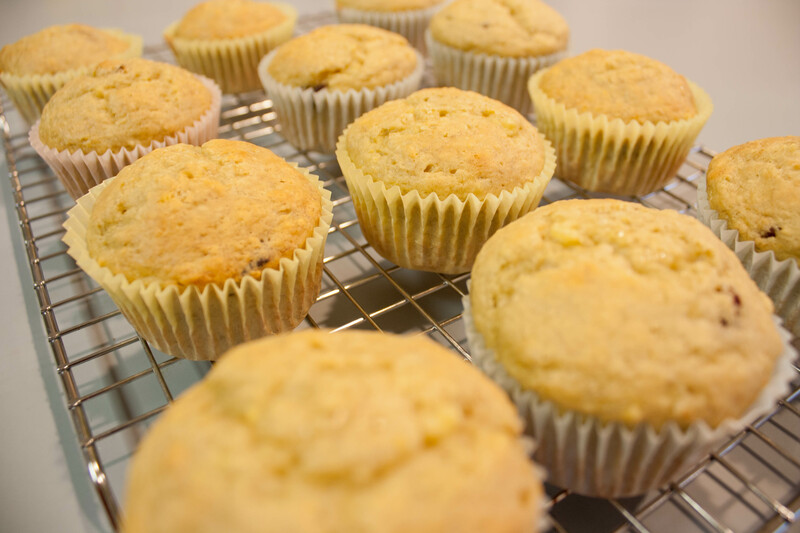 That looks similar to my banana bread recipe, but I’ve never made it as muffins, You should check out the breakfast cookie recipe I posted today (no added sugar!). Carla recently posted..Two steps to a bathing suit body! Hemp hearts. Interesting! Never heard of it! unfortunately with Pinterest, most people are just repinning so the descriptions “sounds” like they added a comment but it’s from an early pinner or the original poster. They aren’t stupid – they know that healthy will get more attention in the keywords!! I’d love to take a look at your recipe pins! I agree about pinterest. After awhile it’s all the same stuff over and over again and most of it is silly. Michelle recently posted..What Do John Cusack And Michael Rapaport Have In Common? They were very good and impossible to screw up!